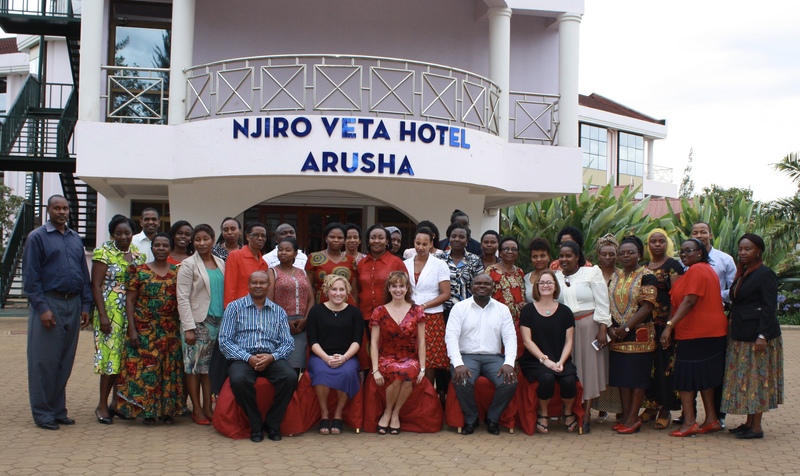 ISTEP Tanzania – One week after arriving home from teaching New Venture Development and Design (a short course on Entrepreneurship in Arusha, Tanzania) I have had time to reflect on this amazing experience. 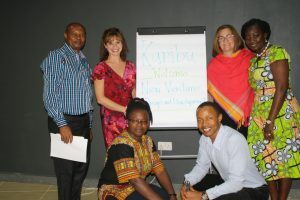 I found out in September that I would have the privilege of returning to Tanzania in November, this time with Amy Savoury, Tourism and Culinary faculty from Kingstec Campus. I had been farther South in Tanzania in March, interviewing entrepreneurs with my Academic Chair, Jim Bate, in preparation to write curriculum for an Advanced Entrepreneurship course. This time, I was excited to be in the classroom, teaching one of my passions. We planned our trip around the long weekend so we would miss the fewest classes with our students at home. Of our six full days in the country, Amy and I spent four days at the college and two days participating in experiential tourism activities. We visited an inspiring, innovative entrepreneur named Mama Gladness at the Tengeru Cultural Tourism Village where we learned her story of empowering women and youth through entrepreneurship and coffee. 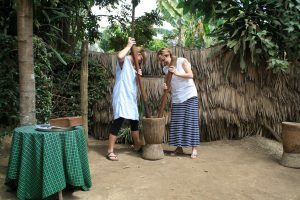 We walked through coffee and banana plantations in the village and then roasted, ground, and drank our own Arabica coffee before sharing a traditional East African lunch together. I brought 5 kgs of coffee home to use at the Pictou Campus Enactus café, a fundraiser for our Enactus team, which operates under the same mandate of empowerment through entrepreneurship. We traveled to the Ngorongoro Crater, a deep, volcanic crater; the largest unflooded and unbroken caldera in the world. It is about 22 kms across, 600 meters deep and 300 sq kms in area. Here, the Maasai Tribe co-exist peacefully with wildlife and with tourists. We spent a morning on safari in the crater, seeing over 27 different species of animals and birds including elephant, wildebeest, buffalo, rhinoceros, zebra, hyena, warthog, ostrich, hippo, and 15(!) lions! 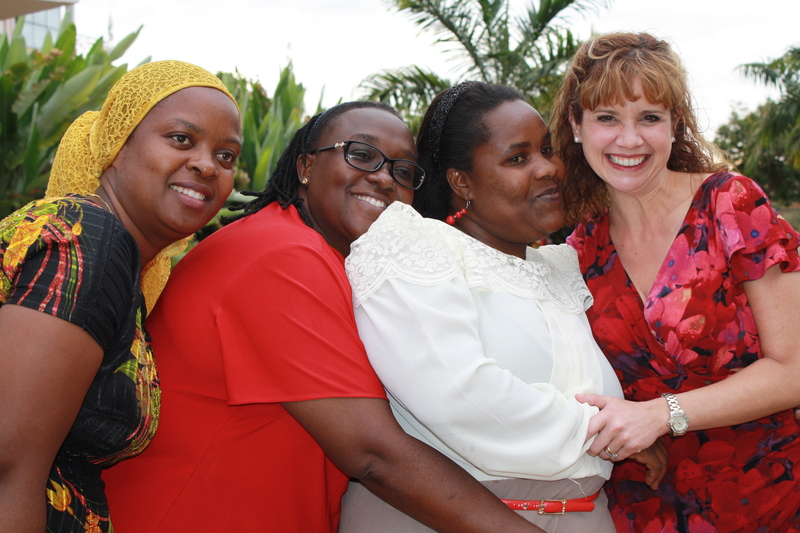 Working with a team of four faculty from VHTTI in Arusha was fun and eye-opening. We had 28 learners in our course, all teachers who were interested in writing a business plan for a business idea to supplement their income, or a business they were already involved with and wanted to expand. The ideas ranged from exporting live rabbits to the Philippines, a tilapia fish farm, a millwright business, a t-shirt silkscreening business, and a plan to develop a hotel vocational training school. There were also horticulture, event planning, bakery, and chicken farming business plans. The feedback we received from the students was all positive, except that they would have liked the course to last longer. 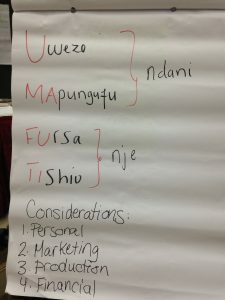 What a learning experience for us to be facilitating in a classroom where not everyone was comfortable with English; however, the language barrier was not insurmountable and we managed to understand one another. 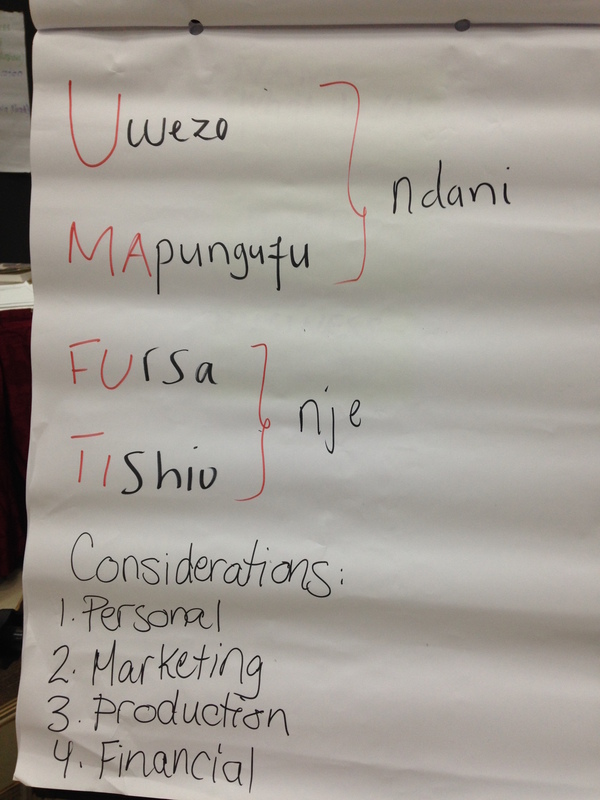 Our colleagues translated the documents we had taken with us into Swahili and we learned that in Swahili a “SWOT” analysis is known as “UMAFUTI”. The participants in the course were engaged and we were fascinated that during the development of class norms, they not only mandated that there would be a TSH1000 fine for lateness and ringing cell phones, but they also COLLECTED the money at the end of each day! Our participants worked their jobs all morning, then engaged in the classroom with us from 1 – 6 p.m. before going home and doing their homework in addition to household chores! We were so impressed with their work ethic. They were curious, enthusiastic, and dedicated. While at the college, I was also able to make connections for our Enactus Pictou team, and I look forward to developing a project this year which will potentially lead to my return with students in the Spring of 2018. I am in love with the people and culture of Tanzania. The people are warm and resourceful; the food is fresh and healthy; the service is attentive and personable; the geography is vast and diverse; the culture is joyful and colourful. At no time did we feel unsafe, and we met so many people who became our “rafikis” (friends) and wanted to take us to show more of their country to us. We had a small-world story in Ethopia on our way home. We had a three-hour layover in the airport in Ethiopia, so we sat at a table in one of the lounges to hook into the wi-fi. We overheard two English-speaking men looking for seats and offered for them to join our table. As it turned out, they were Canadian peacekeepers, returning home from a six-month mission in South Sudan. One was in Edmonton, and the other was from Halifax County, Nova Scotia! What are the chances of meeting someone from home in an African airport 10,500km away?! It truly is a small world! 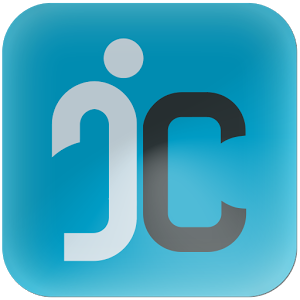 What I have learned through my travels, both personally and with NSCC, is how different people aren’t. We are them. They are us. If we open our hearts and minds to the diversity in the world, we will learn how much the same we really are and how much we can learn from one another.